We have a camera in a Tree Swallow nest box. Monday June 5 First egg. Adding more feathers. Tuesday June 6 Second egg. Adding more feathers. Female on the nest at dusk. Left the nest at full dark. Wednesday June 7 Third egg this morning. She spent most of the day outside the box, but did set on the eggs for a while. She came back onto the eggs in the nest at dusk and still there at full dark. Still on the nest at 11pm, head under wing. Thursday June 8 Fourth egg this morning. She was on the eggs for a while this morning. Cooler this afternoon, female on the nest most of the time. This evening she is on the eggs with her head under her wing. Friday June 9 Fifth egg this morning. She spend quite a bit of time on the eggs today. Left the nest after evening rain showers probably to feed. Back on the nest before dusk, and head under wing on the eggs at dark. 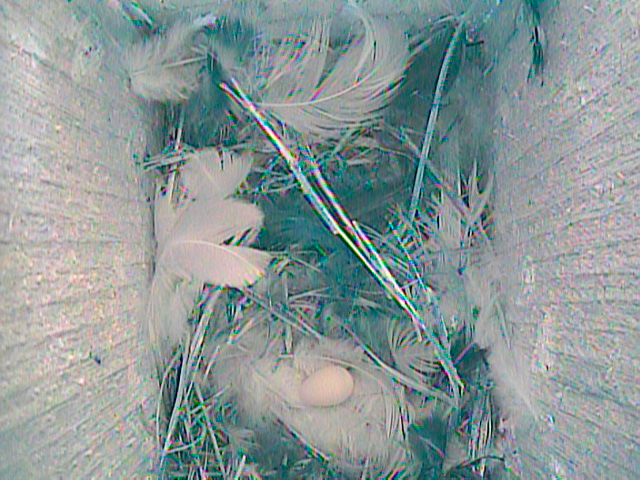 Checked at 12:45am and she was not on the nest, raining lightly. Saturday June 10 Still 5 eggs in the nest this morning, female not on the nest. In fact no swallows around at all this morning (or at lunch time.) Chilly and raining. No swallows this afternoon. Saw 2 swallows around 7pm, not interested in feathers, no activity in the nest. Mama swallow returned at 8:45pm, tweeted at the eggs quite a bit, sat on them for 5 minutes, left and came back several times, then seems to have settled on the eggs for the night. Still on the nest at midnight. 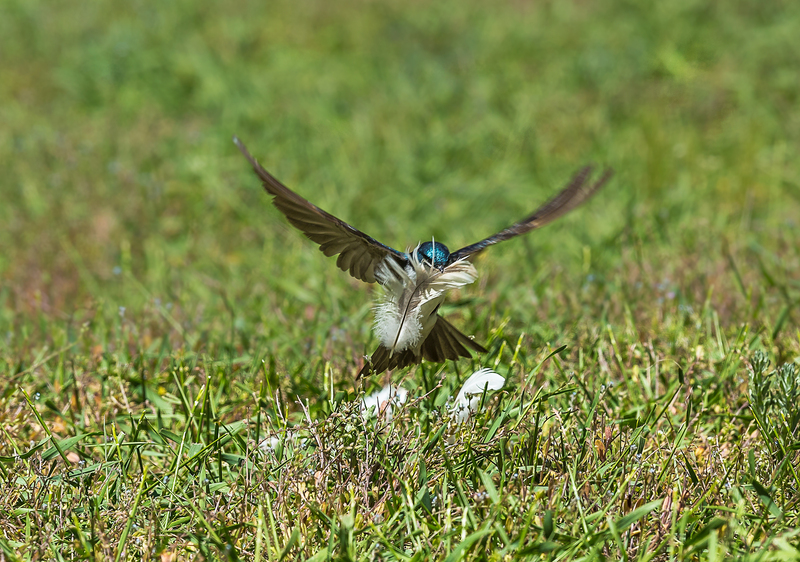 Sunday June 11 Female setting on her 5 eggs this morning, turning eggs and snuggling down under some feathers. Have not seen the male yet. 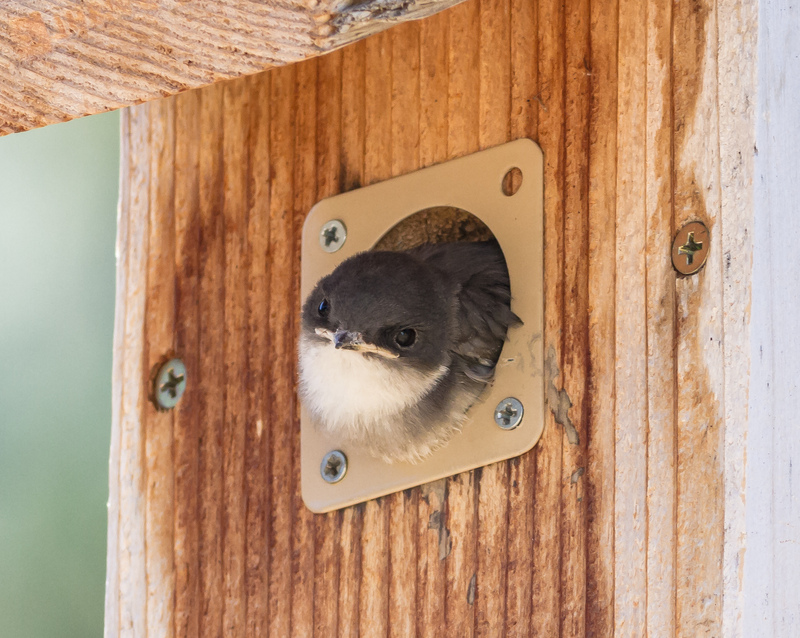 Not many swallows flying, but see faces looking out of nest boxes. She has been on the eggs almost continuously all afternoon and evening. Sleeping on the nest after dark. Saturday June 17 Female on the nest this morning. Seeing more swallows flying around, some of the males must have returned.